Senate President Pro Tem Martin M. Looney, left, and Republican Leader Len Fasano in a file photo from the 2016 session. Senate Democrats and Republicans finalized a deal Thursday on how an evenly divided Senate will operate in 2017, agreeing that Senate President Pro Tem Martin M. Looney, D-New Haven, will remain as the top leader, while sharing some authority with the GOP. 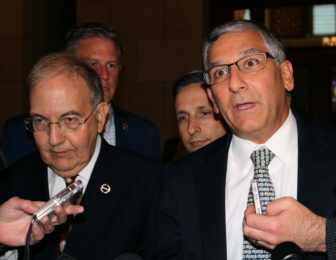 The deal came after weeks of fitful talks, including an unexpected telephone call Looney made to Senate Minority Leader Len Fasano, R-North Haven, on Wednesday night, a day after Looney’s kidney transplant at Yale-New Haven Hospital. Looney’s retention of the top spot reflects an edge Democrats kept as the GOP picked up three seats in November to turn a 21-15 Democratic majority into an 18-18 tie: The ability of Lt. Gov. Nancy Wyman, a Democrat, to break ties as the presiding officer. Without a deal, Senate Republicans were prepared to file a lawsuit Thursday seeking a declaratory ruling that the presiding officer’s ability to break ties did not extend to the election of the Senate’s top leader on Jan. 4, the opening day of the five-month session. Fasano’s new title will be Republican president pro tem. Senate Majority Leader Bob Duff, D-Norwalk, will retain his title and responsibility for calling bills to be debated in the Senate, though the GOP would have the right to force a vote on what business comes before the Senate, with Wyman able to break a tie. Sen. Kevin Witkos, R-Canton, will be the deputy Republican president pro tem. Even had the GOP failed in court, operating the Senate without a working agreement could have slowed or even paralyzed the Senate and, by extension, the House. An unhappy GOP could have shut down the Senate every time a Democrat was absent. Each legislative committee now will have two Senate co-chairs, one Democrat and one Republican, giving the GOP additional influence over whether Senate bills will progress from a committee to the floor of the Senate. Each committee will have an equal number of Democrat and Republican senators, though House members will give Democrats small majorities on panels. Both Senate chairs will have the right to split a committee into House and Senate panels – all General Assembly committees are joint panels of the House and Senate – thereby allowing each chair an equal influence over Senate bills and agendas. Republicans won concessions on how quickly budget votes could be called and how labor agreements would be reviewed. A budget bill would have to be available for review for at least 12 hours before a vote. There is no deal to vote on every labor contract or arbitration award as the GOP had sought, but Republicans will have the next-best thing — the right to force a vote on whether to debate labor agreements. There is one major contract amendment already pending before the General Assembly. Gov. Dannel P. Malloy and the State Employees Bargaining Agent Coalition announced a deal earlier this month to restructure payments into the worker pension system. To limit the growth in annual costs between now and 2032, the agreement would shift at least $13.8 billion in estimated pension expenses owed before 2032 onto a future generation. In a statement, Looney praised Fasano for agreeing to a power-sharing deal. Looney expects to be present on opening day, though his schedule will otherwise be limited for weeks. Fasano said he was surprised to get the call from Looney on Wednesday night, so soon after receiving a kidney donated by a mutual friend, Superior Court Judge Brian T. Fischer. Fasano said Republicans have not resolved who will be appointed Republican state auditor, but it now appears unlikely that the choice will be a Republican member of the Senate. Applicants included one or more members of the Senate. If one were selected, he or she would have had to relinquish their seat before the session opened, leaving the GOP with 17 members. Fasano slightly hedged, however, saying his main focus in recent days has been on resolving how the Senate would proceed on opening day. Connecticut’s auditors of public accounts are two appointees of the General Assembly: one Democrat and one Republican. Robert M. Ward, the GOP auditor, retired in October.